Pregnancy. What a wild ride it is…and each time is different. My first pregnancy was cut tragically short due to a miscarriage after 7.5 weeks and ended in devastation and sadness. My 2nd pregnancy, I was a nervous wreck for the entire 1st trimester and then some. Afraid to work out. Afraid of another loss. 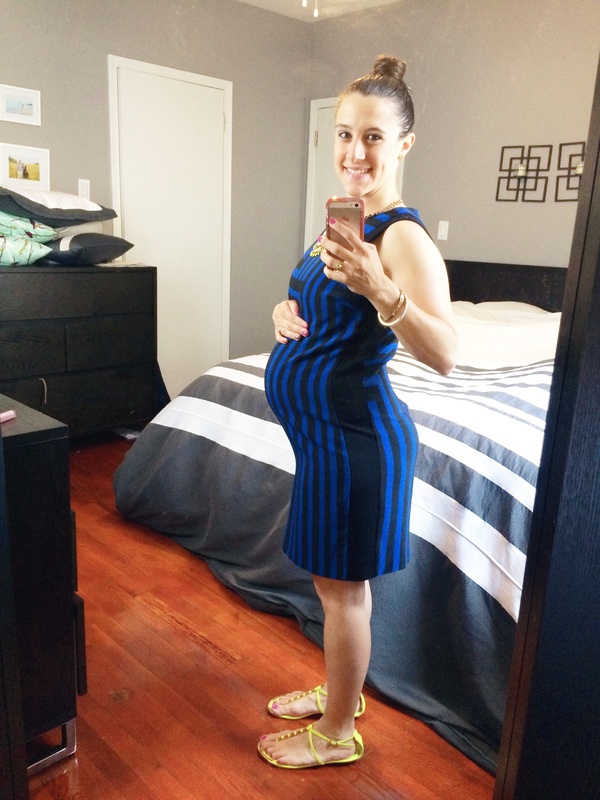 Eventually as time wore on, I started to become less nervous and embrace my pregnancy along with all the ups and down, scares, vomiting, nausea, itchiness, heartburn, early contractions, duck waddling, and more. With every sonogram (and I had a lot of them) I felt closer and closer to my Little Monkey. Eventually, on August 29, 2013, my little boy was brought into the world and everything made sense. All of that craziness was worth it, and my life was forever changed. I can’t believe that little boy is now almost 2 years old, and I have another on the way. I thought this was bad before, but this pregnancy was much worse! Previously, I would get sick, and then feel better, but I pretty much felt a constant wave of nausea all day every day for the entire first trimester. Even if I got sick, I did not feel any better. I tried ginger candies (I was repulsed), preggie pop drops, eating small frequent meals, and sea bands, but nothing really seemed to do the trick except letting time pass. I was also much more exhausted, but couldn’t exactly fall asleep whenever I wanted to. Knowing that I was able to get through this first rough of a 1st trimester with everything else going on in my life makes me feel like one tough cookie. This is probably BY FAR the most challenging aspect of this pregnancy! Previously, if I needed a nap or I felt sick I could lay down and rest. As a stay-at-home working mom this time around, I cannot just take a break when I need to. My toddler is very active and wants to run around and play all day. He takes one nap a day, and at the beginning, I was napping right along with him! With the 2nd trimester, I gained a lot of energy back, and now I work during his nap time, but it was a a struggle in the beginning. There was a lot of time for planning during my last pregnancy, but I feel as if this pregnancy is just flying right by! Anyone that can get through a pregnancy while taking care of a toddler is tough in my book! Speaking of work…since the company I was working for folded in September, I decided to take a step in a new direction as a fitness coach and freelance writer. I now stay at home with my son, work from home, and make my own schedule, but it’s also extremely tough to fit everything in in one day on top of being pregnant. Toddler playdates, doctor’s appointments, conference calls, emails, quiet time to write, taking care of the house, building a business…there is so much to fit in each day, and only so much time. I find myself working a lot of late nights trying to get it all done, and luckily my husband is good about letting me sleep in a lot so that I don’t run myself ragged. As I said before, I was previously scared to work out during my last pregnancy. I walked a lot, which was a great way to keep active, but I did not feel “in shape” at all. This pregnancy, I have been doing the PiYo program (combo of pilates and yoga) at least 4-5 times per week for at least 30 min per day, hiking on weekends, etc. My body feels so much more physically fit, strong, & toned, and my lungs have so much more endurance and capacity. I feel so much more energized on a daily basis after I have completed my workouts, and I generally just feel tougher! I do feel that I generally ate pretty healthy during my last pregnancy, but since becoming a fitness coach, I have paid even more attention to what I am putting in my body on a daily basis…especially processed foods and sugars. Of course, this pregnant mama is never going to completely cut ice cream out of her diet…I mean we all have to live a little, right?!?! Sometimes those pregnancy cravings will get the best of me for sure. I am not perfect, and will never claim to be! But on the whole, I am conscious of what I am eating and I strive to make healthy, clean choices for myself and my growing babe. I have a newfound confidence this time around. I mentioned being afraid a lot during my last pregnancy…but this time I am more confident with my decisions, I realize that there are some things that are just out of my control, and I have to let go a little. I generally have an idea of what to expect this time for labor and delivery (although I do understand that things could be completely different), so I am not super anxious about what’s going to happen. I understand that things may happen unexpectedly, I now know what contractions feel like (and I know to drink tons of WATER to prevent dehydration and early contractions), and I know not to freak out if I go into my regular check up and they tell me I am not leaving without a baby. I feel prepped and I feel calm. I’m actually more anxious about how things are going to go POST-delivery when I have two children! Haha. Curious as to what you other mamas are going through out there? How have you been feeling throughout your pregnancy? If you are pregnant for a 2nd time around, have you felt that it’s been easier or harder? Do you feel tougher as well or has it all been a lot to handle? I definitely feel that my workouts combined with my nutrition have played a HUGE role in my “toughness” this pregnancy, both mentally and physically. It keeps me going and keeps me strong. Happy Monday to all you Mamas, and everyone else out there reading! We had a nice weekend with family and friends. Today marks 28 weeks pregnant for this gal. Let’s make it a great week!